IN a generation driven and connected largely by smartphones, the Internet, YouTube, social media and online gaming, the race to be awesome was won by a boy who, without a care in the world, was pictured lounging on the back of an otherwise menacing looking buffalo while surrounded by a full grown herd. 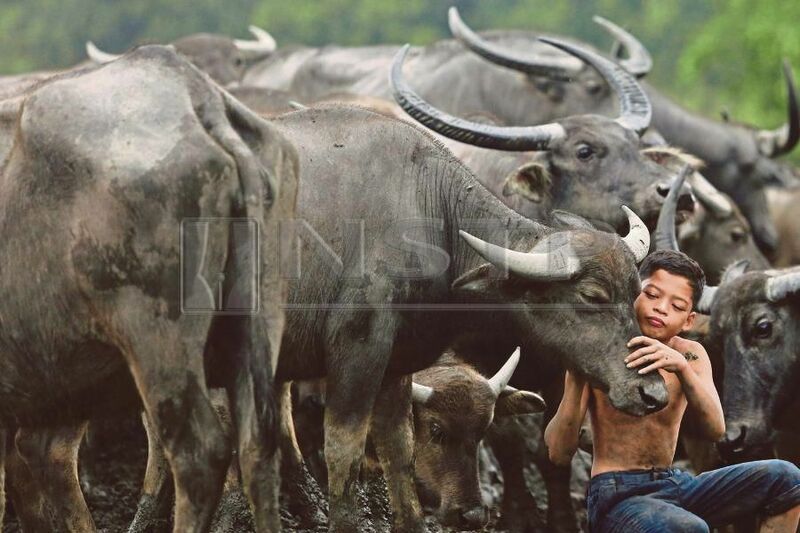 It was a pretty picture, the boy and his buffaloes, somewhat in harmony, in an environment of a bygone era. Buffaloes are no puny animal as everything about them is tough. A full grown animal may weigh up to half-a-tonne, with thick hides, sharp pair of horns and hooves almost half the size of dinner plates. Even their meat is tough. Especially those that have been left to roam free for a considerable period are not to be messed around with. They are unpredictable, and dangerous, especially when cornered and it is common where I spent much of my childhood years, that the only way to put one down for slaughtering was by a round of a Remington shotgun shell. But there was the boy, showering much love for his herd, and they too for him. It was a picture considered a rarity in a now technology driven society and that it attracted much attention perhaps say that for many, the carefree life in the kampung remains a fond memory. On our large tract of land then, we had chickens and ducks running around. We had a cow I had to care for as well, and like the boy in the picture with his buffaloes, it was more a companion than simply an animal, save for that one instant when in a fit of rage, it chased me around the compound, ending with me stumbling into a bush of thorny bougainvilla. It was the period when anytime between sunrise and sunset was playtime, when every rustling of leaves and dry twigs was an invitation to adventure, and, when the only signal of the day ending was our parents’ loud calls ordering us home as the sky turned crimson red. It was a time when we thought little about jumping into the rivers. They were much cleaner then and much less choked with silt and rubbish that came with development and money-making ventures. We scoured the bushes, waded the streams and climbed hills barefooted and almost always shirtless, our frail bodies driven purely by curiosity, the sense of adventure and the innocence of childhood. But amid the carefree life as children, life in the kampung itself wasn’t always easy and almost every parent toiled in the fields and plantations to prepare their offsprings for better lives in the towns and cities. Most left for the bright lights and faster-paced lives and education ensured them of better status than that of their parents’. For a while they came back for visits but as their parents passed on, the visits became farther in between and eventually stopped. Life in the kampung became just part of their history and for their offsprings, only the subject of stories they sometimes tell them. But the kampung itself eventually changed over time and with progress, and much of the changes have been for the better. Almost every kampung now have electricity and piped water compared with when I was growing up in one, where we only had gasoline lamps for light and a well for our water supply. Technology has reached the kampung, too, as telecommunication companies, terrestrial and satellite television networks widened their coverage. For mine, perhaps the most glaring sign that the old days of the kampung was gone was the arrival of a British supermarket chain to a nearby town a few years ago and when the kampung folks learned to shop with trolleys. They now buy chicken from the supermarket, not having to chase one around the compound like I had to before. Today the town itself has everything from the local delicacies to that famous American fried chicken when once I only knew it as the place where to get our supplies of animal feed from. In the kampung these days, not many children roam the bushes and rivers to trap birds and to fish anymore. Increasingly, even they are becoming more attracted to that world that exists online, making it a common sight now of a child sitting on a wooden bench outside of the house staring into his mobile phone. But just as we thought that the kampung has all but changed, the picture of 14-year-old Syukur Khamis of Kampung Kubang Bujuk in Terengganu went viral. While Syukur himself thought little about the pictures, they struck a chord within hearts of those who had spent part of their lives in a similar environment. For the online technology generation, where cloud is more associated with computing than rain, the pictures of Syukur and his buffaloes were still nothing less than awesome, cool, OMG, ROTFL and that smiling emoticon all rolled into one.